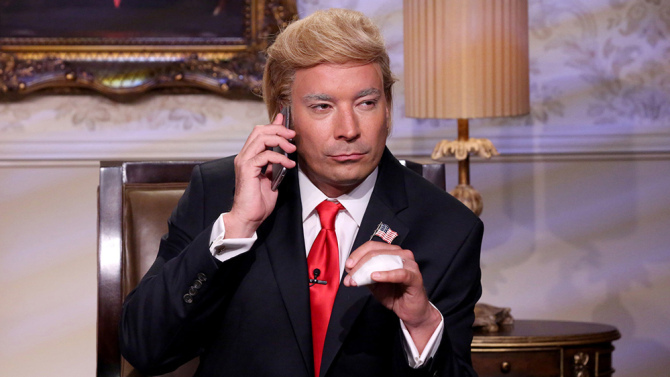 Jimmy Fallon’s late night show got the “Donald Trump bump up” as the RepublicanÂ presidential hopefulâ€™s appearance took â€œThe Tonight Showâ€ to its biggestÂ ratings for a Friday broadcast in over eighteen months. NBCâ€™s â€œTonight Showâ€ brought in 4.5 million TV viewers, according to Nielsenâ€™s numbers. The week-one duel between Fallon and CBSâ€™ new â€œLate Showâ€ host Stephen Colbert ended with â€œLate Showâ€ drawing 3.5 million. Colbertâ€™s guests on Friday included Amy Schumer and Stephen King. Trump is set to visit â€œThe Late Showâ€ on Sept. 22. CBS noted that â€œLate Showâ€™sâ€ Sept. 8 premiere episode has set a new record for total streams via CBS.com and CBS apps. The pattern after four days indicates that NBCâ€™s â€œTonight Showâ€ will continue maintain a comfortable lead over CBS and ABCâ€™s â€œJimmy Kimmel Live,â€ barring big stunts or guest booking coups. For CBS, the win with Colbert moving into â€œThe Late Showâ€ host slot is double-digit gains compared to the networkâ€™s performance in the time slot this time last year. And Colbert is clearly drawing a younger audience than David Letterman did in his final season. With the high level of scrutiny on the Fallon-Colbert competition, the biz will be eagerly awaiting the first time-shifted ratings for the new era of late-night. But that will require some patience. Nielsenâ€™s live-plus-3 ratings for this past week are not expected to be released for another two weeks because the L3 turnaround time for the late-night daypart is much longer than it is for primetime ratings.